This product is an aluminum conduit profile. The dimensions of this profile is 60 millimeters by 120 millimeters, with a hollow inside. Therefore it’s ideal for leading cables and wires through its inside to wherever these components are needed. The cables and wires are hidden from sight and your build maintains a neat appearance. Profiles make up the biggest part of most constructions, being used to build the frame and the base that other elements are added to or branch off of. 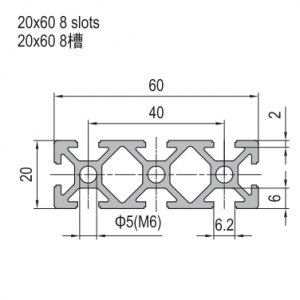 Finally, along the sides of the profile are t slots – which are used to connect various elements to the profiles.